Fun fact! 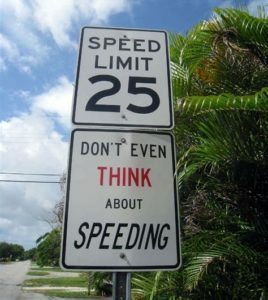 The first speeding law in the U.S. was passed in 1652 in the Colony of New Amsterdam which is New York today. Thou shalt not gallop thine horse or wagon. The fine back then would be equivalent to $150.00 in 2016 dollars. Yikes! Not much has changed. For the 8 out of 10 families living paycheck to paycheck an unexpected bill like this is a big deal. The startling reality is that 28% of us cannot handle a financial emergency of even $10.00. We are strapped as a nation and are not prepared for even the most mundane of surprises. And traffic tickets are really sort of a mundane surprise. Most people (ok, not YOU) receive a ticket or two in their lifetime. Between 2010 and 2015 about 1 in 5 drivers did. Putting it together, most of us can’t afford a ticket, any ticket. And many Americans will reach for the credit card or borrow the money from friends, family, or a lender. Even a payday lender. Because, the consequences of ignoring a citation can be devastating. Let’s face it, fines can continue to grow and in the worst case, you lose your license or car and then how do you get to work? But borrowing the money can mean interest on top of fines. And if you already struggle to make your minimum payments? Danger, Will Robinson, danger. So, what to do? My recommendation is to get a “baby” emergency fund, set aside in a bank account, as quickly as possible. Aim for $500 to $1,000.00. Another option is to utilize the “grace period” that time between the ticket and the court date, which is approximately 4-6 weeks or a few paydays, to pick up an extra shift, make some side money, or take another part-time job to earn all or part of the cost. If you do use part of your baby emergency fund, make sure you replenish it as soon as possible after you pay your fine. For higher traffic and criminal justice fees and fines, this can be very difficult and create a huge hardship. So, you need a meticulous plan which requires a written budget, and cutting back on expenses, which may include cancelling unnecessary services such as cable or fancy ring tones, or a monthly subscription service for the short term. But you CAN do it. Time to think about those dings to the budget that are unexpected, but really very likely to happen at some point. Take the smart step to put some money away “just in case” and get your monthly cash flow under control by knowing where your money is going with a written budget. Be the boss of your money.